We'd gone to the Moma to see the Van Gogh and the Colors if the Night and the Joan Miro: Painting and Anti-Painting exhibitions but it was Kirchner and the Berlin Street that really thrilled us. This small show, that sadly finished its run on Monday, was a true delight. 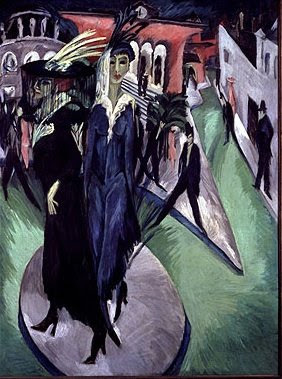 Depicting Berlin's working women in the years just before World War I, the colors are thing you notice first about Kirchner's art; vibrant pinks and luminous yellow, moody greens and blues. The stylised figures, elongated streetwalkers and their furtive clients with blackened eyes, reminded me both of El Greco and the masked characters in James Ensor's paintings. Danger is here on the Berlin streets, you feel the furtiveness of the figures in the background, but there is also vitality, the women dress alluringly in furs and plumed hats. It's almost like looking at stills from My Fair Lady or mannequins in a department store window. This exhibition along with other works by Ernst Ludwig Kirchner can be seen next at The Brücke-Museum in Berlin, if you are planning a visit to Germany between December 13 and March 15 2009.